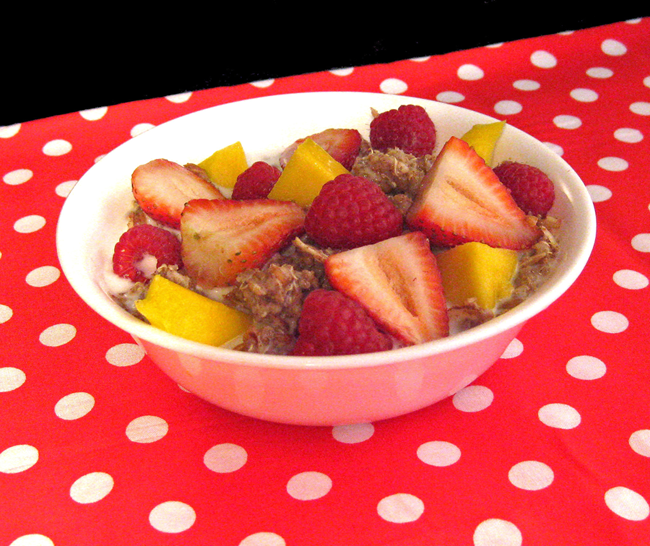 Multigrain hot cereal with mangoes, strawberries, red raspberries, and toasted walnuts and almonds. This recipe is a favorite! So I hope you will like it. Like many of the previously featured dishes from the past few months, this one's also part of the ongoing "Resourceful Recipes" series. In case you need a refresher or are just tuning in, the Resourceful Recipes" series is intended to provide solutions for those who want to cook healthy and economical meals for their families. Related posts will demonstrate how to make the most of humble foods or provide creative ways to use up leftover ingredients. In this particular instance, the whole grains featured in this recipe are not only highly nutritious, but also happen to be fairly basic, inexpensive staples with a long shelf-life. And best of all, you'll be able to easily find most of the ingredients in your local supermarket. The only things that could possibly be challenging to find are the millet and wheatberries, although at this point in supermarket evolution, the former will probably be more readily found than the latter. However, if you can't find millet for some reason, you can try either a health store or an international supermarket. (I found millet at the latter, in the Indian section of my local international supermarket.) Or, you can always buy millet online. That's where I got the wheatberries. More specifically, I've found that Barry Farms sells great products (via Amazon.com), so I've stuck with them for the wheatberries and other types of specialty grains, etc. 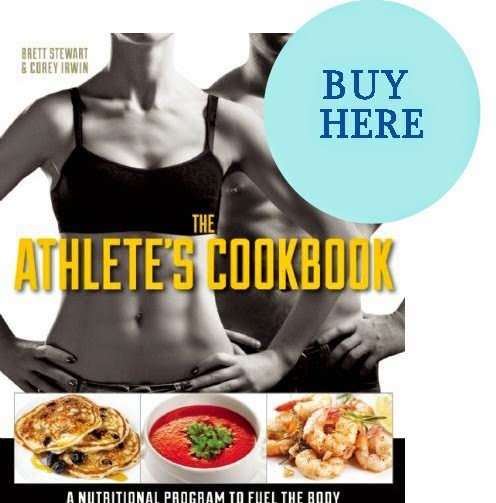 Not only will you be able to find direct links to these resources within apropos recipe posts that call for these ingredients, but I've also embedded my store into this site as an inline frame so that you'll be able to shop at Amazon.com directly from my website without even having to leave the page. 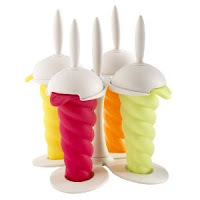 (Please note that all transactions are secure/encypted and handled directly via Amazon.com.) So, this way, if you need to find an online resource for a particular recipe on my blog, you won't have to look very far. So, anyhow, let's get back to talking about this recipe and its nutritional value: As you may know, wheatberries are not only to used to make bread; they can also be cooked and consumed whole. Of course, they are much healthier this way as the whole form preserves the bran, germ, and endosperm of the wheat, i.e., the most nutrient-rich parts of the grain. :) So basically, it's the entire whole wheat kernel minus the hull. :) Contrast this to processed wheat products, in which these components are removed, stripping roughly 40% of the original nutritional value from the grain. So what does a wheatberry taste like? Well, in my opinion, they taste great! :) They have a slightly nutty flavor and are slightly chewy when cooked. Thus far, this blog only has one other wheatberry recipe, a pilaf dish, but I plan to make more recipes using this very versatile grain. So, this way, you'll have more opportunities to try out a wider array of wheatberry dishes and also use up that bag of wheatberries you just bought from my Amazon Store. :) Lol. --Most of the nutrients in bulghur are kept intact as only a very small amount of the bran is removed. Directions: Bring covered pot of water to a rolling boil, about 6-8 minutes. 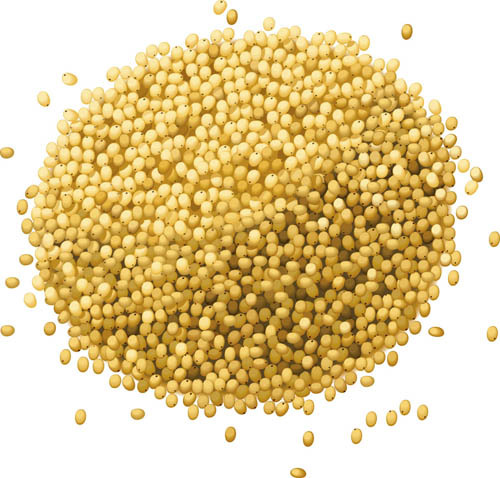 While you're waiting for the water to boil, soak quinoa for 5-10 minutes until it starts to puff up a bit. (This is a very important step as quinoa needs to be soaked in order to release its saponin, which creates a bitter taste unless removed.) 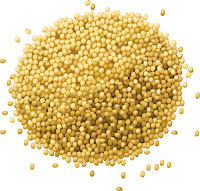 When quinoa is ready, transfer into a fine mesh sieve, rinse under running water, and then drain and set aside. When water has reached a rolling boil, remove lid, add wheatberries, and then cover again with lid and boil on high heat for 15 minutes, or until slightly tender. Then remove lid, add millet, stir once or twice, cover again, and boil for another 20 minutes. Reduce heat to low, then add rinsed and drained quinoa, stir, cover once more, and simmer for an additional 5 minutes. Water should be almost absorbed by this point. If necessary, add a little bit more water to keep the bottom of the pot from scalding. Uncover, add oats, bulghur, and vanilla extract, stir, cover again with lid, and cook for a final 5 minutes. While the hot cereal is in its last 5 minutes of cooking, place nuts onto an aluminum-foil covered toaster pan and toast on 350°F for 2-3 minutes, or until light golden brown. Watch nuts carefully, as they will burn very easily. When finished, set tray aside to allow nuts to cool for 5-10 minutes. When cereal is ready, uncover, and then stir in honey, cinnamon, and salt. (Or, alternatively, let each person add their own amounts to taste, according to personal preference.) Fluff, then let stand 5 minutes to cool slightly. Pour in milk and stir in fruit and nuts. Place into bowls, serve, and enjoy. 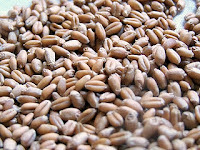 Chef's Notes: *Wheatberries: I recommend using the hard red spring variety, since it's got the highest protein content out of all the different varieties. 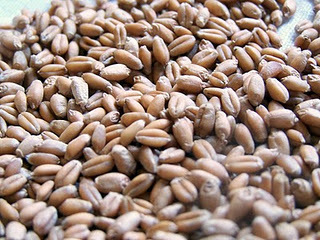 Wheatberries take a while to cook, but if you cook them with the lid on, they'll cook a lot faster. :) Please note that if you don't cook them long enough, they're going to be a bit tough and overly chewy. So, in other words, do something else in the kitchen while they cook, so you'll still be near enough to watch the pot but at the same time won't be tempted to pull them off the stove a bit early. ;) This is definitely one instance in which patience pays off. :) Remember that, after the wheatberries, you'll be adding the next set of ingredients in another 20 minutes, so best to set the timer for 15-minute intervals and check on the water level a bit early, just to be on the safe side. **Oats: Nutritionally speaking, steel cut oats are a better source of fiber and nutrients than rolled oats, as they contain the whole oat kernel, (whereas most of the bran is removed for the latter). 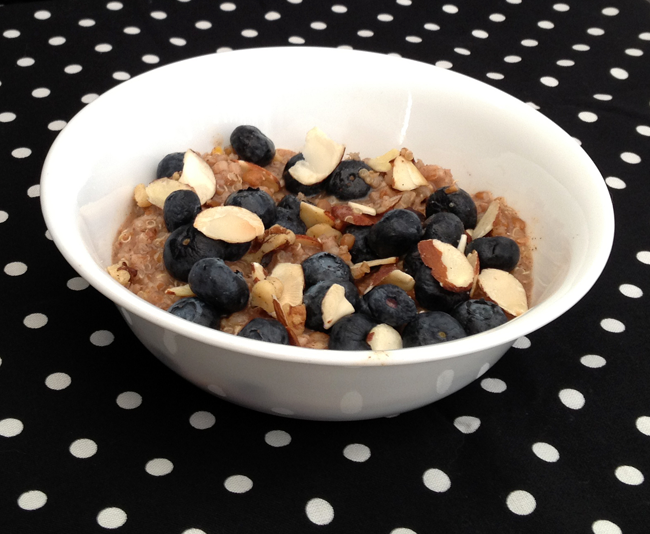 Although steel cut oats are less processed than rolled oats, they take longer to cook. I didn't happen to have steel cut oats on hand when I was creating this recipe, so I just used regular, "old-fashioned" Quaker oats, as they called. However, if you'd like to use steel cut oats instead of rolled oats for this recipe, then I suggest you add them at the same time you add the millet, since they take at least 20 minutes to cook. ***Alternative toppings: If you've got a limited selection of available seasonal fresh fruit, another great idea is to add raisins &/or other types of dried fruit (dried cherries, cranberries, etc.) to your hot cereal, which can either be incorporated separately or mixed together with whatever fresh fruit you have on hand. Or, another creative idea is to add fresh coconut slivers or unsweetened shredded coconut, either in addition to or as a replacement for, the almonds and walnuts.